This past Saturday evening, May 12th, My New Red Shoes held “Rock the Runway,” a community fundraiser and celebration of our impact in the community! The evening raised $130,000 including a record $74,000 during the Fund-a-Need, which was directed towards the Heather Hopkins Impact Fund in support of new community and program initiatives that will expand our reach and impact. 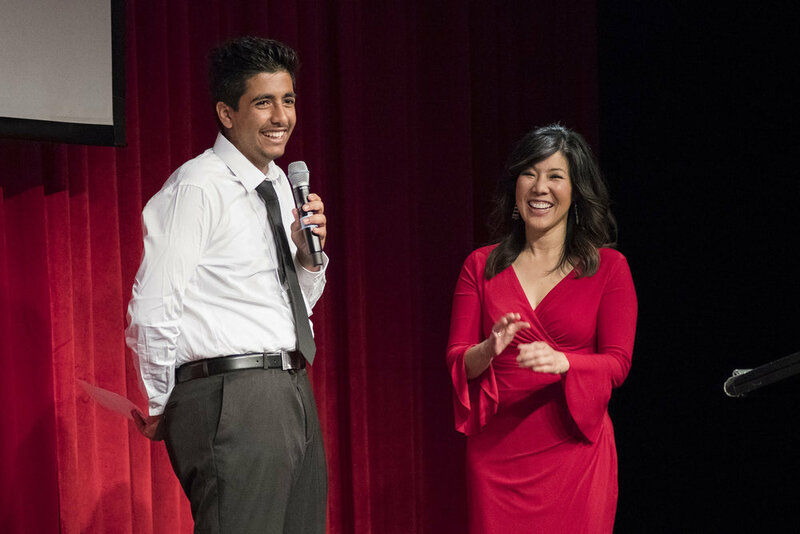 The inspirational event culminated in a fun and energetic Youth Fashion Show, produced by MNRS' Interns and showcasing 40 youth from across the Bay Area. Thank you to our supporters and friends who contributed to the event's success! Inspired to action by her mother's personal experience with childhood poverty, our founder, Heather Hopkins, started My New Red Shoes in 2006 to serve children like her mom - who suffered the childhood indignity of going to school in clothes and shoes that made her feel like "the poor kid" year after year. Under Heather's leadership the organization grew from serving 354 children to helping more than 55,000 homeless and low-income children across the SF Bay Area by 2017. In honor of her leadership and entrepreneurial spirit, My New Red Shoes is pleased to announce the Heather Hopkins Impact Fund to support new programs and initiatives that will deepen the organization's impact and scale its work. During the Fund-a-Need, supporters contributed more than $74,000 to seed the fund and support the launch of a new initiative to clothe newcomer immigrant, refugee, and migrant students as they enroll in school, at any point during the school year. Nida is the Family Resources Coordinator at Bret Harte Middle School in the Oakland Unified School District, where she assists newcomer families in registering their children in school, finding needed resources (food, shelter, clothing, etc. ), and supports non-English, Arabic-speaking families navigate the school system. Nida is an avid social justice advocate and volunteers with several Bay Area non-profit social justice organizations. She was recently awarded the 2018 "Local Hero Award" by the City of Oakland, CA. Akram is a My New Red Shoes Program Recipient. Born in Yemen, Akram arrived in the United States in 2016 and settled in Oakland with his family. He is currently a student in the 10th grade at Oakland High. My New Red Shoes was founded in 2006 to boost the self-confidence, quality of life, and educational experience of students in need. Since 2006, we have provided more than 55,000 students living in poverty with the basic necessities of new shoes and clothing while working to build a stronger, healthier and more inclusive community for all children through civic service and learning opportunities for volunteers of all ages. By meeting student's basic clothing needs, and enhancing their developmental assets, we are helping to boost school attendance, classroom and social inclusion, and the self-esteem and confidence of our community's vulnerable children and youth. Over the last 10 years, our Fashion Show Fundraiser has raised more than $800,000 in support of our mission.